And you keep it [fish] frozen all winter. If you get hungry, you just split it open, while it’s frozen. You dip it in seal oil. It’s good. The arctic grayling, a large-finned cousin of the trout, is easily taken with a hook. One method is to jig for them through river ice. Theresa Nanouk: Grayling-ŋanun una manaqsuutauvaliaruq. Iŋilgaan nauŋ grayling-ŋatmanaguugait. Theresa Nanouk: Sulukpauġaq. That’s right. Anna Etageak: They’ve got a big . . .
Theresa Nanouk: They have a big fin, a long fin. Aron Crowell: How do you fish for grayling? Oscar Koutchak: It’s similar to the tomcod. You jig. Aron Crowell: When do you fish for them? Oscar Koutchak: The first ice at the mouth of the river or mouth of the sloughs. Theresa Nanouk: But you get them all winter long in the river. Oscar Koutchak: And in the fall time, we seine them a lot. And they’re good. And if you get hungry, you just open the gut with your [thumb] right near the first gill, and you open it like that [pull down with bent thumb]. If there’s eggs in there, you just wash them off and eat them if you get hungry. They’re very good. Suzi Jones: How do you eat grayling? Oscar Koutchak: You boil it. Theresa Nanouk: Bake it, any old way. Any old way you could make fish. Oscar Koutchak: And you keep it frozen all winter. If you get hungry, you just split it open, while it’s frozen. You dip it in seal oil. It’s good. 1. 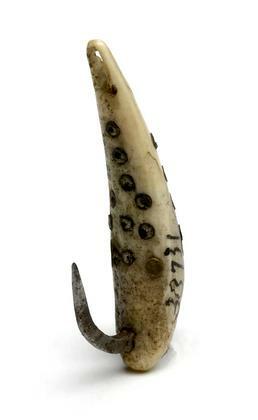 According to Frances Charles, bear claws were used in the past to make grayling hooks.